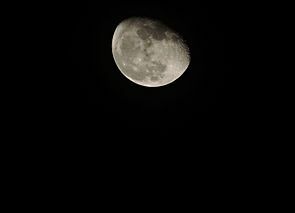 A shot of the moon from a Nikon P530 42X superzoom bridge camera. Bridge cameras are cameras that fill the niche between the single-lens reflex cameras (SLRs) and the point-and-shoot camera which are prominent in the prosumer market segment. 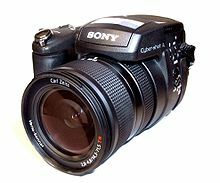 They are often comparable in size and weight to the smallest digital SLRs (DSLR), but lack interchangeable lenses,[not in citation given] and almost all digital bridge cameras lack an optical viewfinder system. The phrase "bridge camera" has been in use at least since the 1980s, and continues to be used with digital cameras. 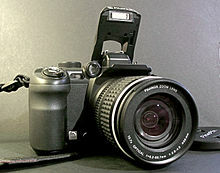 The term was originally used to refer to film cameras which "bridged the gap" between point-and-shoot cameras and SLRs. Like other cameras, most current bridge cameras are digital. These cameras typically feature full manual controls over shutter speed, aperture, ISO sensitivity, color balance and metering. Generally, their feature sets are similar to consumer DSLRs, except for a smaller range of ISO sensitivity because of their typically smaller image sensor (a DSLR has a 35mm, APS, or Four Thirds size CCD or CMOS sensor). Many bridge cameras have long zoom lenses which now often start at a super wide-angle focal length of 20 or 22mm equivalent focal length (in 35mm film camera terms), so the term "bridge camera" is sometimes used interchangeably with "megazoom", "superzoom", or "ultrazoom." However, some bridge cameras have only moderate or short zooms (such as the Canon Powershot G9), while many compact cameras have superzoom lenses but lack the advanced functions of a bridge camera. With zoom ranges and sales rapidly increasing in the early 21st century, every major camera manufacturer has at least one 'super zoom' in its lineup. Sales of bridge cameras with DSLR-shape and MILC are steady in the overall context of declining camera sales. Bridge cameras typically have small image sensors, allowing their lenses also to be smaller than a 35mm or APS-C SLR lens covering the same zoom range. As a result, very large zoom ranges (from wide-angle to telephoto, including macro) are feasible with one lens. The typical bridge camera has a telephoto zoom limit of over 400mm (35mm equivalent), although some 21st-century cameras reach up to 2000mm. For this reason, bridge cameras typically fall into the category of superzoom cameras. A typical example is the 24× Zoom Nikkor ED 4.6-110.4mm f2.8-5.0 on the Nikon Coolpix P90, which in 35 mm equivalent focal length terms is a 26-624mm. To reduce aberration in a lens with such ambitious specifications, these have quite complex constructions, using multiple aspheric elements and often anomalous-dispersion glass. In this example pincushion and barrel distortion can be corrected in the camera firmware as well. The ability to fit such a wide zoom range in one single small-diameter lens makes lens interchangeability for the purposes of focal length (as opposed to performance in low light or image quality) redundant for most photographers. Most bridge cameras allow the use of secondary lenses to improve wide-angle, telephoto or macro capabilities. These secondary lenses typically screw onto the front of the primary lens either directly or by use of an adapter tube. Superzooms have typically had a large f-number (aperture) especially at the long end. The resulting depth of field prevents the use of shallow field methods, and prevents photography in low light without the use of either flash or a tripod. Several recent models, however, offer apertures as wide as f/2.8 at the long end. Bridge cameras employ two types of electronic screens as viewfinders: The LCD and the electronic viewfinder (EVF). All bridge cameras have an LCD with live-preview and usually in addition either an EVF or an optical viewfinder (OVF) (non-parallax-free, as opposed to the OVF of DSLRs, which is parallax-free). A high-quality EVF is one of the advanced features that distinguish bridge cameras from consumer compact cameras. All DSLRs, by definition, have a through-the-lens OVF. Newer DSLR models typically also allow 'live view' on the LCD screen as an alternative to the OVF, although frequently without autofocus or with very slow autofocus. Mirrorless cameras and dSLTs use LCD or electronic viewfinders. The EVF of bridge cameras, and the LCD of bridge cameras and DSLRs in "live view" mode continuously show the image generated by the sensor. The continuous digitally-generated live view has some advantages and disadvantages compared to the optically-generated view through the OVF of DSLRs. One advantage is that the digital preview is affected by all shooting settings and thus the image is seen as it will be recorded (in terms of things like exposure, white balance, etc.) which the OVF of DSLRs is incapable of showing. Another advantage is facilitating the framing from difficult angles by making the LCD movable (vari-angle). The LCD and EVF normally show 100% of the image while previewing (WYSIWYG). The OVF of professional DSLRs normally shows 100% of the image, but the OVF of consumer DSLRs may show slightly less than 100%. In addition, automatic modes tend to work better. The camera has a view of the full image, rather than the very limited information from an autofocus sensor, and can be much smarter about picking exposure, objects to focus on, and other settings. Finally, EVFs allow the viewfinder to show a range of information beyond the photo being taken. In particular, they allow for accurate image review, particularly in bright sunlight when the image would be washed out on a DSLR LCD. They can overlay a much richer array of focusing aids, levels, camera settings, and other information than a conventional DSLR viewfinder. The electronic screens of some bridge cameras do not work as well as the OVF of DSLRs in situations of low light (although some work better, allowing high gain and slow refresh). For bridge cameras with EVFs, the LCD screen might be difficult to see and use for framing in bright daylight. Also, especially with older or lower-end cameras, the screen resolution and refresh rate may be limiting compared to the very high resolution and real time view provided by an optical path in the OVF of DSLRs. Low resolution impedes some forms of manual focusing, but most modern bridge cameras implement a method called focus zoom which automatically magnifies a central frame within the screen (manual focus point) to allow easier manual focusing. A slow refresh rate means that the image seen on the screen will have a fraction of a second lag or delay from the real scene being photographed. The electronic screens used in modern bridge cameras are gradually improving in their size, resolution, visibility, magnification and refresh rate. Continuous operation of the sensor shortens battery life and raises temperature. A DSLR's sensor (when not in live view mode) only operates when the shutter is open, and the electronic screen is typically off more, causing less battery drain. Just as in compact cameras, there is a trend towards larger sensors in bridge cameras, as well. Sony started the category of 1 inch sensor equipped bridge cameras in 2012 with the Sony Cyber-shot DSC-RX100, followed in late 2013 with the release of the Sony RX10. In 2014, Panasonic followed this with the FZ1000, which has a larger zoom range, up to 400mm equivalent (Sony's RX10 goes to 200mm equivalent). In contrast with the RX10's constant f/2.8 widest aperture Zeiss lens, the Panasonic FZ1000 has a variable f/2.8 to f/4 Leica creation. Sony's DSC-R1 issued as early as 2005 has a 10Mp APS-sized sensor combined with a Zeiss zoom lens. In terms of image quality, these cameras are comparable to Canon's DSLRs and similarly priced. In late 2012 Techradar wrote that while the general compact camera market was on a downturn, the DSLR-like bridge camera market was continuing well. In 2014, CNET mentioned that for the last couple of years, Fujifilm focused on producing rugged compact cameras and bridge cameras as those segments continue to show strong sales. As of mid-2014, all major camera manufacturers have at least one DSLR-shaped superzoom bridge camera with 50x magnification or higher, except LG and Pentax which both have bridge DSLR-shape superzoom camera with lower magnification. Low-end mirrorless interchangeable lens cameras offer an alternative to bridge cameras. They feature a large sensor, as on a DSLR, and an interchangeable lens, but no mirror, and hence no through-the-lens optical viewfinder. Some mirrorless system cameras share a compact size and electronic viewfinder with bridge cameras, and some models offer image quality as good as DSLR cameras. However, superzoom options for mirrorless cameras are still limited, especially in terms of very long focal lengths. It is generally more difficult to design superzoom lenses with good image quality for large sensors, and hence the zoom range of DSLR and mirrorless lenses is more limited than the 50x and above class of bridge cameras. DSLRs and mirrorless cameras therefore require changing lenses to reach the same versatility as superzoom bridge cameras. Wikimedia Commons has media related to Bridge cameras. ^ a b Colton, Sandy (1988-04-29). "New Bridge Cameras Offer Perks To Novice And Pro Alike". Pqasb.pqarchiver.com. Retrieved 2010-05-29. ^ a b Boy Toys By Ding (2008-05-25). "Dominating the bridge market". Sundaytimes.lk. Retrieved 2010-12-30. ^ "Sensor Sizes: Camera System: Glossary: Learn: Digital Photography Review". Dpreview.com. Retrieved 2010-12-30. ^ "New Bridge Cameras Offer Perks To Novice And Pro Alike". Pqasb.pqarchiver.com. 1988-04-29. Retrieved 2010-12-30. ^ "Call Them A Bridge Or A New Concept - Or Call Them Fun". Pqasb.pqarchiver.com. Retrieved 2010-12-30. ^ "Long shots: Full-size megazooms compared". CNET. CBS Interactive. Archived from the original on 3 February 2014. Retrieved 16 August 2015. ^ "Pentax XG-1 announced: Ricoh turns the ultrazoom bridge camera up to 11 with a 52x zoom lens". Retrieved 16 August 2015. ^ "Canon Powershot G9 Digital Camera Review". Ephotozine.com. 2007-12-10. Retrieved 2010-12-30. ^ "Best Superzoom Cameras 2010". Safari-guide.co.uk. Retrieved 2010-12-30. ^ "Nikon P900 vs Sony HX400 Comparison". March 19, 2015. ^ "Panasonic Lumix DMC-FZ50 Review". 1 September 2006. Retrieved 16 August 2015. ^ "COOLPIX P90 from Nikon". Nikonusa.com. Retrieved 2010-05-29. ^ "Digital Camera Viewfinders: OVF, EVF, LCD, SLR, DSLR, Optical, Electronic, Tunnel". NeoCamera.com. Retrieved 2010-12-30. ^ "Camera Sensor Ratings by DxOMark". Retrieved October 15, 2014. ^ "Verdict Canon's superzoom bridge packs a whopping 50x zoom". October 15, 2012. ^ "Fujifilm FinePix S1 review: A 50x zoom for whatever weather you're in". Retrieved June 15, 2014.